"The real crime is the one that you want to commit." Luchino Visconti's final film isn't elegiac, exactly, but neither does it forge much new ground for one of the great masters of Neorealism�watching it, you get the sense that later in his life Visconti was content to play out variations on his favorite themes, and there's much here that's truly sumptuous. Certainly it's eclipsed by Visconti's masterpiece, The Leopard, made thirteen years earlier, even as it treads on much of the same territory. We're invited to read The Leopard metaphorically, about not just the travails of a particular aristocratic family, but as a farewell to a life fading away, undone by modernism, by democracy, by Italian unification. 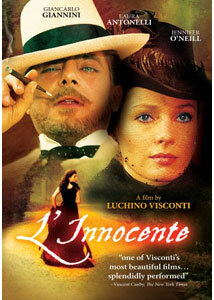 L'Innocente, by contrast, is ostensibly about one man's tortured soul�but in reality, it's much soapier, a kind of nineteenth-century game of musical beds, and is of a piece with the many film incarnations of Les Liaisons dangereuses. A devastatingly handsome and nattily attired Giancarlo Giannini plays Tullio Hermil, bored with his child of a wife, Giuliana (Laura Antonelli), and in throes to his voluptuous mistress (Jennifer O'Neill). He's very pleased with himself and his many discreet adulteries, thinking it's all oh so mature, until he learns that the tables have been turned�Giuliana has been stepping out with the celebrated novelist of the moment, and Tullio discovers that he's wearing the cuckold's horns. (Insult to injury: Tullio has only contempt for the writer's work.) This of course makes Giuliana newly and uniquely desirable, and much of the movie is about Tullio trying to win back the heart and mind of his own wife. How can he re-invest his marriage with passion, when all that's left, seemingly, is formality and pageantry? The answer, actually, is that we don't much care, and you sort of sense that Visconti doesn't either, because he's so intoxicated with the glorious excesses of the period. On some level it's a movie less about its story than it is about its physical presentation�the locations, and costumes, and attention to detail are all so exquisite that you find yourself attending to them more than to anything else. Also, Giannini looks smashing in the central role, but his character really is rather loathsome�it's almost like the film is daring us, asking us how much nonsense we'll put up with from an increasingly horrid hero, in order to keep watching. It's easy to do so, largely because we get lost in the draperies. Jennifer O'Neill smolders in a role that's crucial to the story, but she actually doesn't have all that much screen time, and the performance is hampered significantly because all of her dialogue has been dubbed. (Visconti long favored this practice, seemingly going for sight over sound�it's got its advantages and its drawbacks, as this film makes clear.) In many respects Antonelli is the linchpin of the piece, but even as her soul is in torment, she's kind of treated like a piece of meat�this is one of those vaguely misogynistic movies in which the leading lady spends a good amount of time with her clothes off, but the leading man's passions are shot only from the neck up. But even if his character is frequently contemptible, Giannini is remarkable at communicating his torment�by the end of the film he's exhausted and rheumy eyed, even if deeply malevolent. We don't end up caring much about the fate of his soul, but it has been a visually intoxicating ride. Image Transfer Review: Unfortunately much of the visual work about which I've gone gaga in the body of this review is undone by a pretty poor transfer. The print is frequently blotchy and pock-marked, there are many scratches, and in many instances the colors have bled out or become severely distorted�what must have been a blood red motif in the original now looks maroon, for instance. This film may not merit the painstaking restoration lavished upon other Visconti pictures, but it's a pity that it doesn't look very good. Audio Transfer Review: Given the huge percentage of dialogue that's dubbed, and that it's all in Italian, anyway, the shortcomings on the audio aren't nearly as apparent as those with the picture; still, there's some occasional nasty static on the track. Extras Review: The one notable extra is a nearly feature-length interview (01h:18m:54s) with frequent Visconti collaborator Suso Cecchi d'Amico, co-screenwriter on this project. She is filmed in the Visconti family villa, where much of her work with the director took place, and this is essentially a film-by-film account of their collaboration, along with brief biographical notes on both her and Visconti. Also, it's worth noting that whoever provided the subtitles does not seem to have mastered English grammar�they're not execrable, but we get mistakes like "You missed a Mozart's" and "Let alone me." If L'Innocente were a musical, you'd come out singing the costumes�it's a fantastically lush production, and you can feel Visconti reveling in the visual glories of every frame. The story isn't nearly as compelling, but it's a handsome coda to a magnificent career.